As a Ligurian native, I’ve seen the Cinque Terre evolve over the years into the well-known Italian jewel it is today. Cinque Terre translates to English as “the Five Lands,” and during my childhood, I knew them as the remote fishermen villages, with friendly locals bouncing around small shops, booths of fresh vegetables, and the church, which was always open, all overlooking the breathtaking Ligurian Sea. The Cinque Terre are idyllic Italian coastal villages, and as a teenager, my friends and I would take Sunday trips down to the small towns on the Ligurian coast. 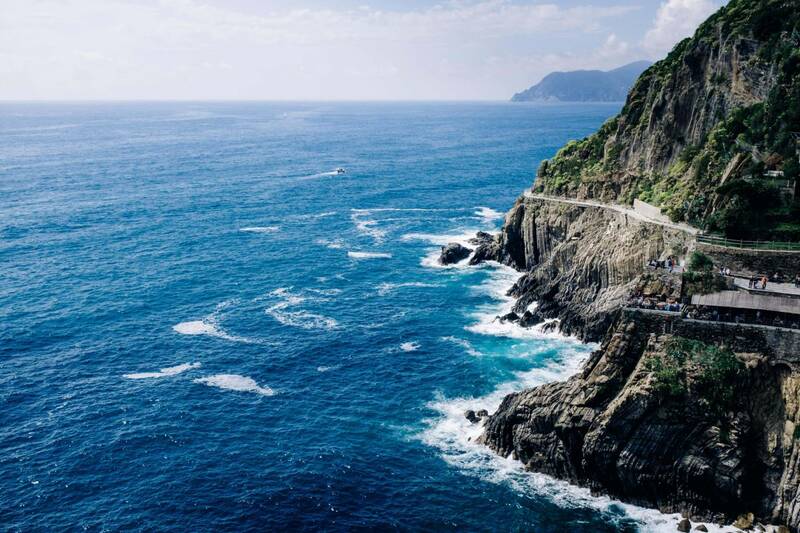 We would ride our moto over 50 miles down the Via Aurelia – a coastal road built by the Romans in 241 BC – past dozens of little villages, on an epic journey to Monterosso and Vernazza, the most lively towns of the five. We would hike the paths between the villages and the vineyards, sometimes passing the local farmers coming to and from their fields, and hunt around the villages for a good lunch. In the past two decades, the Cinque Terre have evolved from the quiet, remote fishermen villages to bustling, lively travel destinations, filled to the brim with boutiques, hotels, and tourists. Seeing these small towns explode with international popularity has been bittersweet; while it is fantastic to see so many travelers come to enjoy the Cinque Terre, the villages are packed with tour groups, bustling through the hotels and tourist shops. Yet the authentic Ligurian coastal towns are not all lost, and I take great pleasure in bringing my guests to the hidden corners of Cinque Terre, climbing through the right streets to re-live the coastal charm and quaint atmosphere from my youth. 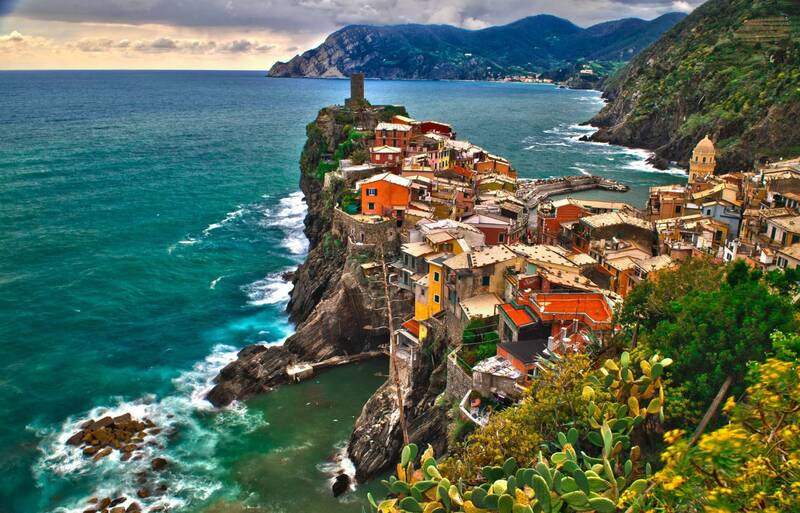 The Cinque Terre consists of five towns, once small fishermen villages, that span the coast of the Ligurian Sea. From east to west, the towns are Riomaggiore, Manarola, Corniglia, Vernazza, and Monterosso al Mare. As the smallest of the towns, Riomaggiore and Manarola resemble the old fishermen villages the most, with only one narrow main street and many small paths that climb up the mountains to reach the buildings above. 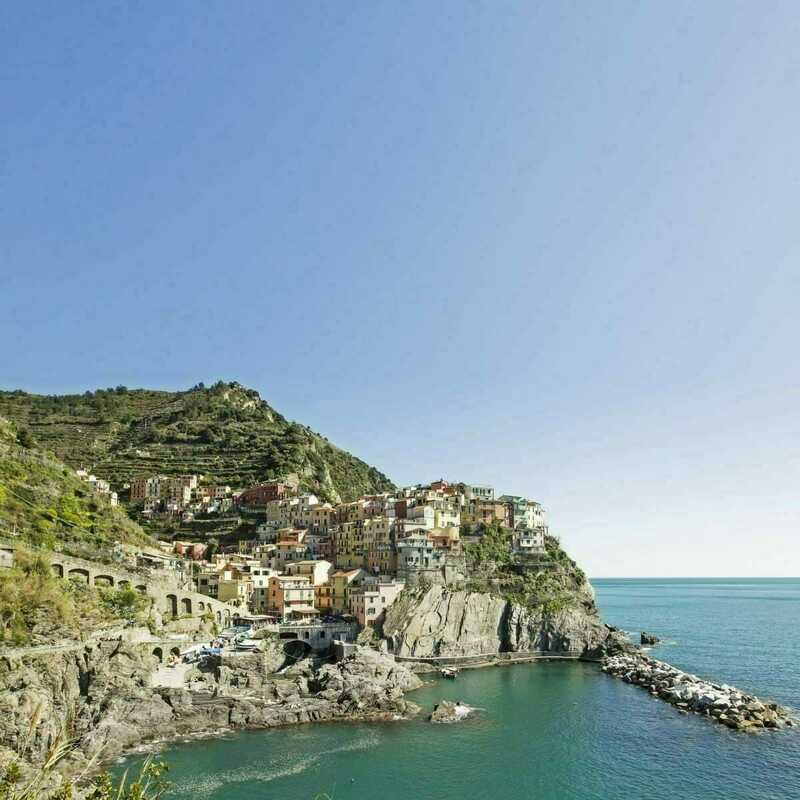 The views are idyllic; I love to visit Manarola to enjoy the regional troffie al pesto* in my friend Cesare’s little restaurant, overlooking the majestic cliffs and blue Mediterranean Sea. The path between the top of the two towns to the bottom of the coast and bay is both lengthy and downhill, taking 10 to 15 minutes on a typical day, and is perfect for the adventurous traveler. 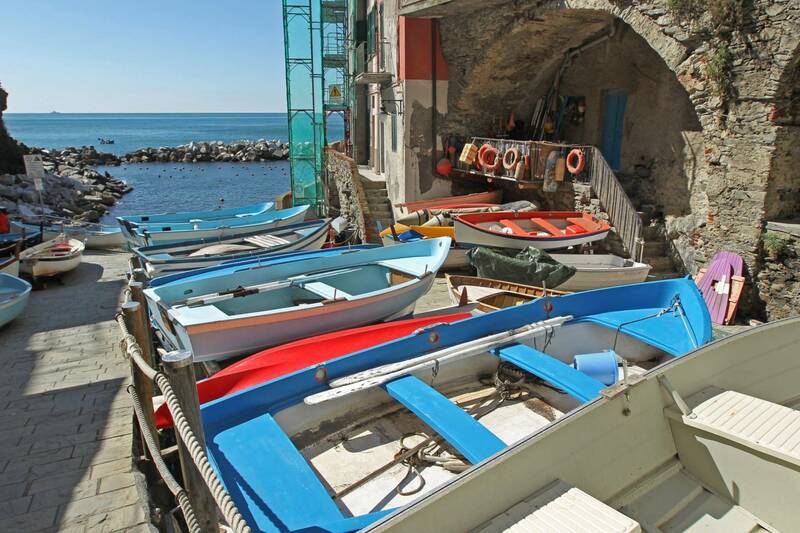 The bay hosts fishermen boats that rest in small platforms next to the water for safety, and in Manarola, you might even catch sight of the cranes lifting the boats to and from the water. There are no beaches, so one should not expect to be relaxing by the waves in these quaint towns; the coastline consists of ragged rock, best experienced with sneakers instead of flip-flops. In the summer, the coastal rocks are extremely hot, so travelers must consider the heat if they plan on taking the trek downhill, making sure to pack water accordingly. The least crowded of the towns and yet still picturesque, Corniglia sits at the top of a hill, far above the water. The scenic cliff is 100 meters above sea level at its peak, and the top of the village provides a spectacular view, full of colors especially towards sunset. Corniglia is the most difficult of the towns to reach, as the train station is closer to the water with a 30 minute walk to the village. Luckily, the town is also typically the least crowded, so the trip is well worth the walk. My personal favorite of the Cinque Terre, Vernazza boasts the traditional charm of the Ligurian fishermen villages coupled with modern features for the 21st century traveler. The town hosts a small beach, many little shops, lots of trattorias, and delectable bakeries, where you can find the local specialties such as the focaccia alla genovese o al formaggio* and the best spaghetti con vongole or pansoti con salsa di noci*. The main street is lively and often bustling, and the square at the end of the street has the perfect balcony to relax with a glass of wine before dinner. 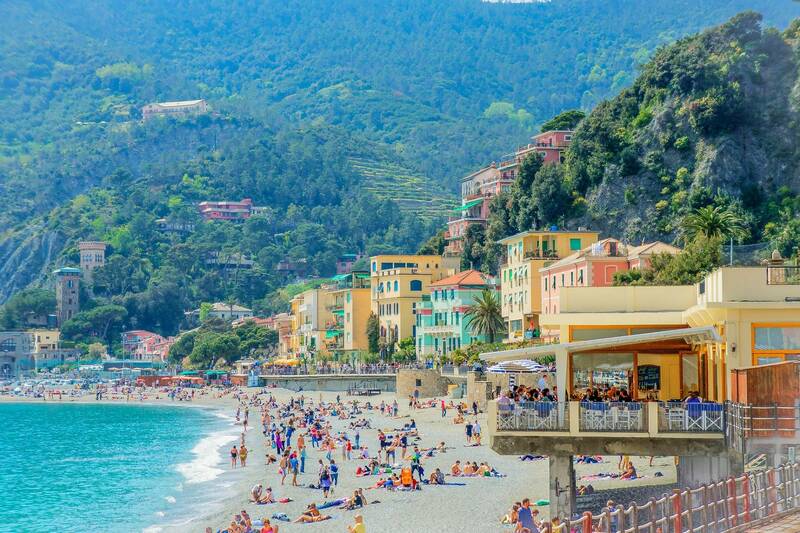 The western-most village is also the most visited; Monterosso al Mare has the most conveniently-located train station, and it also boasts the best parking of the Cinque Terre. The town has a wide, relaxing beach, set just below the colorful town. The area is renowned for both its lemon trees and its white wines, so make sure to try a glass of vino bianco at lunch or dinner. Monterosso hosts many historical sites, including a castle, convent, churches, and the Monterosso Giant, Il Gigante, a massive sculpture of Neptune bearing a villa terrace on his shoulders. The town is a perfect match for travelers who wish to explore the wonders of historical Italy and relish in the natural beauty of the coast. The five villages of the Cinque Terre are interconnected through a web of both roads and trails. The walking paths throughout the Cinque Terre have been used for centuries, and today, they are well-known and well-maintained, often featuring breathtaking views. My favorite path, 2D from Vernazza to Monterosso is unbeatable, with the view of both the villages and the sea, best experienced close to sunset. Many paths also have impressive terraces where the locals still cultivate gardens, full of grapes or veggies. In my childhood, we used to pass farmers on these routes, on their way from producing the local wines, il Pigato* or the precious sciacchetra*. The most famous of the paths, the Via Dell’Amore or Love Path from Riomaggiore to Manarola, is partially closed due to a mudslide that destroyed parts of the pavement. It is set to be reopened in late spring 2019. The walking paths are not the easiest of treks, as they are no walk in the park. The Ligurian coast is entirely mountainous, so all of the paths are steep and narrow. While they are not dangerous, travelers best be prepared for an adventure with sneakers, water, and even walking sticks to really enjoy the landscape. The most important factor that a traveler should consider when seeking out Cinque Terre is timing. For three or four months out of the year, between June and September, it is nearly impossible to navigate the villages because of the seas of tourists bustling through the streets. During this time in the main areas within Cinque Terre, prices skyrocket compared to neighboring towns. 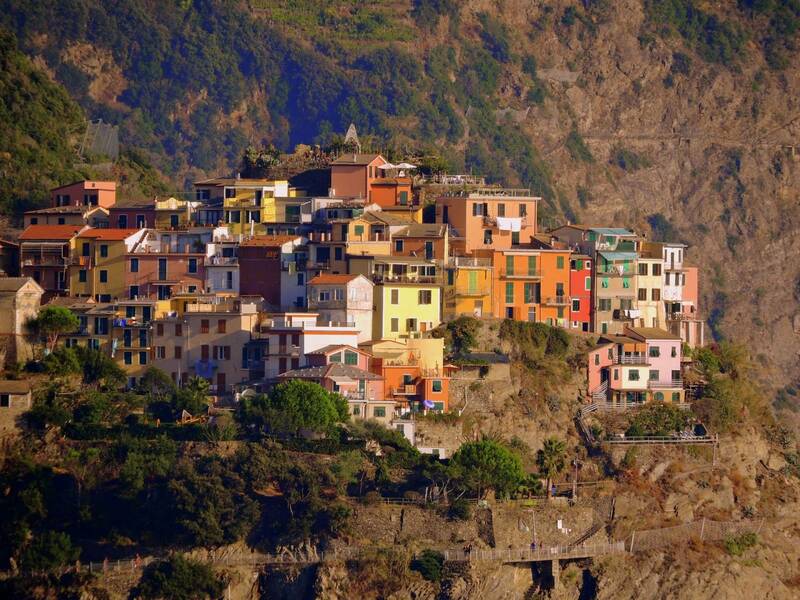 When traveling to the Cinque Terre, avoid trying to travel by car. Due to the small nature of the villages, parking lots are few and far between, and they are filled to the brim between April and October. The road connecting the Cinque Terre is extremely steep, narrow, curvy, and dangerous, and only the most experienced Italian drivers try to drive it. Instead, take the train from Milan (3 hours) or Rome (4.5 hours). Taking the train between the villages will also save you time, money, and frustration. Travelers will often stay in or drive to nearby towns, such as the coastal Sestri Levante, to travel via rail to and from the Cinque Terre. Of the five towns, Monterosso has the largest capacity of parking spots, so many tourists park there to take the train to the other villages. The train ride between Monterosso and Riomaggiore, the outermost towns, is a mere 15 minutes. A special pass, the “Cinque Terre card,” allows travelers to use the regional train to and from the town with no limitations and free shuttles from the stations to the heart of the towns, as many of the train stations are located at a distance. The pass is little more than 10 Euro a day and allows natives and travelers alike to move between the Cinque Terre with ease. 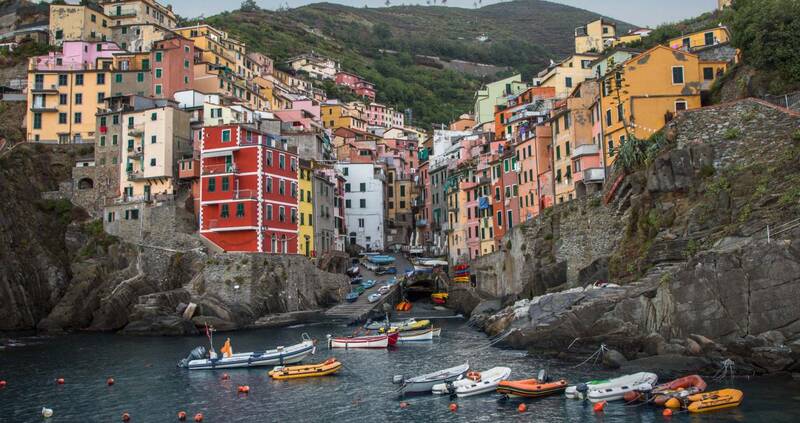 Ready to explore the Cinque Terre? Visit like a local on our tour of Italy’s Finest: Cuisine to Coast.